Thermal Solutions specialist GELID Solutions launches the cutting-edge “GC-Extreme” thermal compound with a net content of 10g. It contains the same material as the multi-winning “GC-Extreme 3.5g” and varies in net content only. In comparison to the other compounds in the market the “GCExtreme” breaks all records and is most suitable for overclocking. Ultimate heat conductivity makes the “GC-Extreme” the leader of all thermal compounds. As with the other compounds of GELID Solutions the “GC-Extreme” is non-electrical conductive, non-corrosive, no bleeding and non-curing. The “GC-Extreme 10g” comes with a GELID applicator which enables an easier application. As a product of the GAMER product line the “GC-Extreme” contains 10g. Beside the “GC-Extreme 10g” GELID Solutions introduces the “GC-Supreme” for professional users. The “GC-Supreme” is made from the purest thermal conducting materials and offers superb thermal conduction. Thanks to nano scale produced new ultra-fine molecular structure the “GC-Supreme” fills spaces more effectively than conventional materials. In comparison to other thermal compounds the “GCSupreme” provides an easier application especially with the GELID applicator. Coupled with excellent thermal conductivity for an attractive price this thermal compound makes the best choice for professionals. As a product of the SILENT product line the “GC-Supreme” contains 7g. 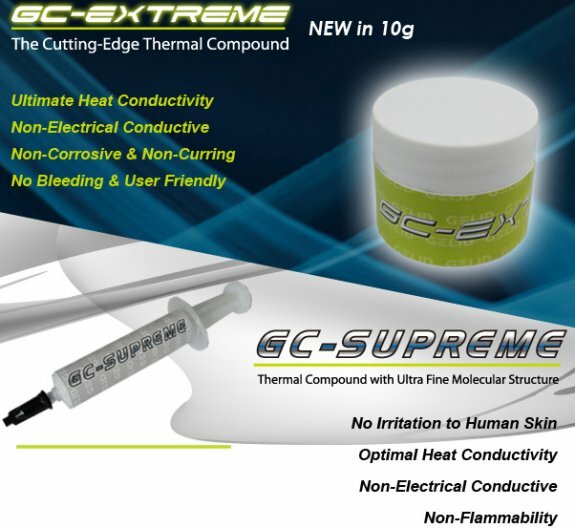 The “GC-Extreme 10g” and “GC-Supreme” thermal compounds are available now for a MSRP of USD 25.99 / EUR 19.99 and USD 7.2 / EUR 5.7.